Junior forward A.J. Pacher led the Raiders with 17 points and eight rebounds in the loss. The men’s basketball team led for most of the first half and had a 36-34 halftime advantage, only to see Santa Clara explode for 47 points in the second half en route to an 81-69 win in the CBI semifinals Wednesday night at the Wright State University Nutter Center. Wright State broke a 10-10 tie with eight straight points and still led 26-18 on a Reggie Arceneaux layup with 7:11 remaining in the first half, but the Broncos followed with an 11-2 run, capped off by two Kevin Foster free throws, to take the lead for the first time at 29-28 at the 3:45 mark. 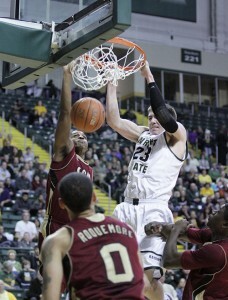 A Matt Vest three and an AJ Pacher foul shot put Wright State back up 34-31 and, after Foster tied the game again with a three, a Pacher dunk at the horn gave the Raiders a 36-34 halftime edge. The Raiders shot 56 percent in the opening 20 minutes compared to 44 percent for Santa Clara. Vest opened the second half with a fast-break dunk, but the Broncos answered with a 14-2 run over the next three minutes to take the lead for good, seven of those coming from Evan Roquemore. Tavares Sledge broke the string with a layup, but that would be the closest the Raiders would get the rest of the way as Santa Clara gradually built up the lead to as much as 16 on two occasions, including 78-62 on a Brandon Clark layup with 2:55 to play. The Raiders actually outshot the Broncos for the game 54-48 percent and hit 13 of 17 free throw compared to 11 of 15 for Santa Clara, but the Broncos were eight of 24 from three-point range while the Raiders were just four of 15. Santa Clara also finished with 16 more shot attempts thanks in part to a 34-27 rebounding advantage, including 13-4 on the offensive end, and in part to a 15-6 differential in turnovers. Those two stats also results in the Broncos leading 11-4 in second-chance points and 19-7 in points off of turnovers, including a 17-2 points off of turnovers margin in the second half. Foster scored 21 of his 33 points in the second half to pace Santa Clara (24-11), hitting seven of 11 shots, including four of seven from three-point range. Roquemore had 16, 12 of those coming after halftime. Wright State (23-13) was led by Pacher’s 17 points and eight rebounds while Jerran Young had 13 and Miles Dixon 10 off the bench.